Dr. Seth Rossinow has been in practice in Livingston for over 20 years. Dr. Rossinow believes that everyone deserves a high level of health and wellness in their lives. He focuses on helping his patients to attain safe and effective care without the use of surgery or harmful medications. In addition to specializing in deep tissue laser therapy, Dr. Rossinow provides general chiropractic, sports injury therapy, spinal decompression, nutritional counseling, wellness and much more. 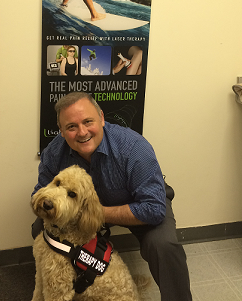 Dr. Rossinow currently resides in Montville with his wife, 3 daughters and dog Bailey. We call Bailey our ‘therapy dog’ because all of our patients love him as well! Dr. Rossinow is an avid cyclist, golfer and skier.